Fans of abandoned & disused London railways have a special treat this Saturday. There's a free Mail Rail open day on Saturday 21st April 2012 where you can see some rolling stock of the old Post Office underground railway (Mail Rail). The Museum Store of the British Postal Museum will be opening its doors for a great opportunity to see a range of material relating to this now disused London underground railway. 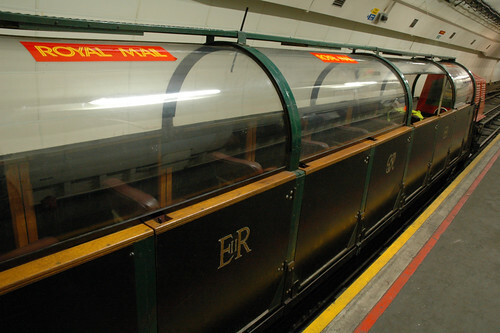 Mail Rail used to carry mail beneath London's streets from 1927. Driverless underground trains transported mail between sorting offices and London's major railway stations up until 2003 when the system was suspended. 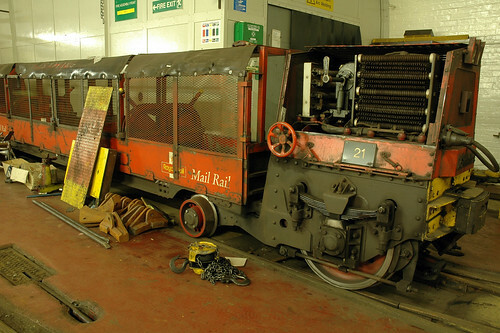 However, in 2012 the British Postal Museum & Archive (BPMA) will carry out some conservation work on a 1930's Mail Rail train retrieved from the network in 2011. "The BPMA now holds three rail cars in its collection, one being the only known complete example of the original 1927 car. Two of the rail cars are being actively conserved and there are plans for the third. During the event on Saturday there will be chance for visitors to witness conservation first hand and to speak to the conservator undertaking the work. BPMA curators will also be on site to answer questions about the railway and there will be some formal talks and tours about the network and also the pneumatic rail system that preceded Mail Rail. The only known survivors of the 19th century underground system will also be on display." said curator Chris Taft on the Museum's blog. On Saturday's event you'll have the opportunity to speak to their team about the preservation of this object, take part in talks, tours, film screenings and other family activities. You'll also learn about the history of the Mail Rail network through historic items from the Archive and Museum Collections. The open day will be at The British Postal Museum Store in Debden and starts at 10am and runs throughout the day until 4pm. Booking isn't necessary and you can just drop in. For more details see their site. Is Brompton Road Tube even closer to Re-Opening?